Hello and welcome to another episode of Raise Your Standards. 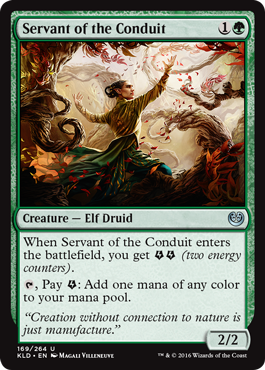 This week, amidst all of the spoilers from the soon-to-be-released Aether Revolt expansion, Wizards of the Coast also released the cards that are exclusive to the new Planeswalker Decks. Since I enjoy a good challenge, I’d like to take a look at the cards that are in the new Ajani deck and see if we can brew up a deck. Let’s start by looking at the man, uh, cat himself, Ajani, Valiant Protector. 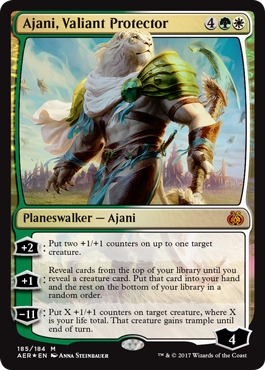 First and foremost, Ajani isn’t cheap. His CMC (converted mana cost) of six is a definite hindrance. As such, our deck should probably begin with thinking of ways to accelerate our mana production. I think cards such as Servant of the Conduit and the new Druid of the Cowl would work great for this. Now that we have the creatures that can either attack or accelerate our mana production out of the way, let’s look for other things we can use in order to make sure we hit the six mana needed to cast Ajani. The first card to consider is Attune with Aether. This will ensure that we continue getting the color of land we need to cast all of our cards and also provides us with some valuable energy to use with Aether Hub. 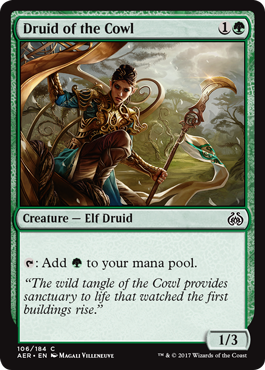 I would also like to consider Oath of Nissa which helps us find a much-needed land or creature or can even help find our Ajani if needed. Next, let’s add something to take advantage of Ajani’s + abilities. His +1 ability allows us to reveal cards from our library until we get a creature card, and then put that card into our hand. His +2 ability puts +1/+1 counters on a single creature. Therefore I think Ajani would work great with creatures that have fabricate. That way, we can search for a creature card that will put more than one creature into play when it is cast. Some good possibilities would be Glint-Sleeve Artisan, Highspire Artisan, Peema Outrider, and Propeller Pioneer. All of these cards can use the fabricate ability to create Servos and build up a large board presence for you. The final creature I would consider adding is Verdurous Gearhulk since it provides additional +1/+1 counters for us to place on our army of creatures. All of these creatures with fabricate can either use their fabricate ability to create Servo tokens which you can use to swarm your opponent with, which will later be able to be buffed by +1/+1 counters, or they can enter the battlefield with +1/+1 counters to be large threats immediately. Personally, the majority of the time I believe it would be best to create the Servo tokens, but I can certainly see situations where having the +1/+1 counters could be the better option. Now, since our goal is to amass a large army of creatures and add +1/+1 counters to those creatures, wouldn’t it be embarrassing to have those creatures destroyed by our opponent? Sounds to me like we need some way to protect our creatures. The best way to do it is by playing Blossoming Defenses in response to the opponent playing targeted removal. I think we’ll add a full playset of those. Another card I’d like to add is Decoction Module. This module can not only be used for removal protection (assuming you have the four mana required to activate it), but it can also be used offensively by returning a creature you control with fabricate to your hand so it can be played again. It’s also another way for you to gain energy for your Aether Hub‘s and Servant of the Conduit cards. This is still a very rough build, and I know it’s not perfect. In fact there’s still more cards I’d like to consider adding to the deck (Oath of Ajani and Nissa, Voice of Zendikar to name just a couple), but I’m out of time for today. Maybe in a couple of weeks, I’ll revisit this deck and see what kind of upgrades Aether Revolt brings for it. I’d love to hear your thoughts on the build so far, and whether you have any suggestions of cards to add or remove. Please let me know by leaving a comment below. And join me again next week when Raise Your Standards takes a look at more innovative Standard decks. But before then, be sure to come back to mtgdecktechs.com starting on Sunday, January 8th, for my review of the cards in the Aether Revolt expansion. I’ll be starting with the White cards and reviewing cards each day next week through Friday, January 13th. See if your thoughts about the new cards match mine, and compare your rating with mine. Aether Revolt looks like it’s going to be a very exciting set, and, as always, I’d love to hear what you think of it. Aether Revolt, Deck Tech, Kaladesh, magic the gathering, Mike Likes, MTG, Raise Your Standards, Standard. Bookmark.